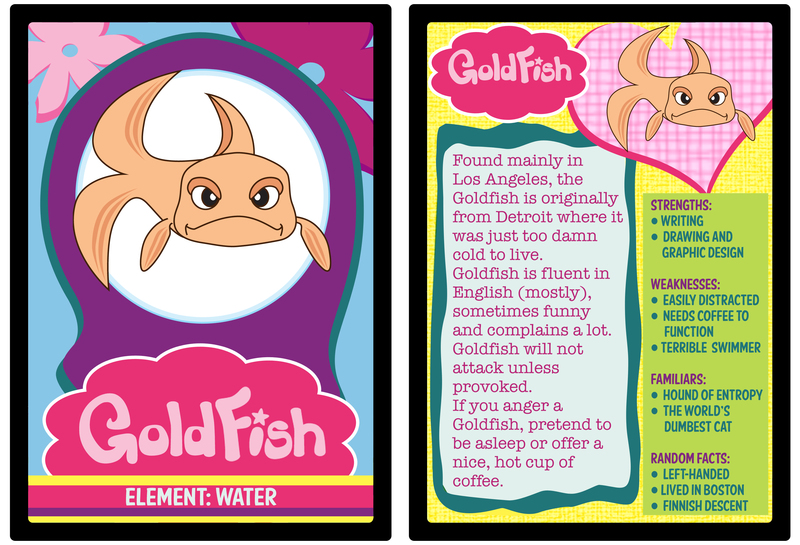 Get your one of a kind Goldfish trading card! Trade them with friends (laminator sold separately). This is not a blog about goldfish. I used to have a goldfish, but it died. That’s not the point. The point is that Fish of Gold (referred to by me, your friendly neighborhood goldfish, as FOG) is a miscellaneous assortment of opinions, experiences, gripes, and stories on various topics. A word of warning: even though that goldfish is pretty cute and I have written a couple of children’s stories, most of this blog is not suitable for children. I tend to swear a bit, and even though a lot of what I write is silliness, sometimes, I talk about Serious Business including current events, politics, religion, child sexual abuse, domestic violence, mental illness, prostitution, addiction, and death. I’m sure there are some lovely blogs out there that are all nicey-nice, pro-god, pro-kids, pro-people and pro-miniature American flags. This is not one of them. I apologize if I got your hopes up, but I’m not actually a fish, gold or otherwise. It would be really cool if I was the world’s first blogging goldfish, but I’m actually a female human. There’s nothing unusual about a blogging female human. If you must know right now why I have that silly nickname since I’m not actually a fish, read the post called Goldfish. Goldfish is a writer and unpublished author, mostly because she hasn’t finished a complete work of fiction and is terrible at self-promotion. For example, she is also a graphic designer, fine artist and digital doodler who encourages you to buy lots of kid-friendly products from her Redbubble shop. In addition to running FOG all by herself for eight lonely years, Goldfish is an official story collector at Stories That Must Not Die, where you are welcome to stop by to read true stories and share your own. Goldfish is a lifelong devotee of coffee, music, and books–not necessarily in that order. Well, probably in that order. She lives in Los Angeles with her animal companions, The Hound of Entropy and The World’s Dumbest Cat, who get along unnaturally well and refuse to pay rent. For you pestery types who won’t be satisfied until you know what I look like, there is one picture of me posted on this blog. See if you can find it. You gave up? So soon? Fine. Here. I want to know who you are, too. If you have your own blog, give me the link. Maybe you have some stories of your own that you’d like to share. I’m sure you’re very nice. Your hair looks good today. I like your shoes. At the very least, if you’re reading this, you have excellent taste in blogs. Hahahaha – this is great – and yes, my shoes are particularly fine and dandy today, so I’m glad you noticed! Hello, Goldfish, I’m not a stalker, but I just left a comment on Plinky too. Just a nice teacher from the Midwest. Liberal and pro-God. I like your blog, and since you commented on my hair and shoes, and were kind to ask if I’d lost weight, I thought I’d comment. Keep writing! Looking for a finish literature I found this site. I enjoyed a lot reading about the blog. Hi GOLDFISH! How are you? Well let me tell you my hairs are actually good, I have very long, shinning black hairs but right now I am not wearing shoes. I have gone through your articles and believe me, you have done a very good job. I am a new blogger and you have inspired me alot, thats why I am following you. Hi, Goldfish! Your blog and your introduction are fantastic! Thanks for sharing. And yes, you should write for living, does not matter what it takes! Hi Goldfish. I love your devil may care take on writing. You can find me at Huffygirl’s Blog. You are a joy to read! Since you are just speaking “one language” (and obviously fluently), my blog would not do much for you. It is written in German. Does not keep me from following yours, though! I share you lack of dedication – but while there’s breath there’s hope. Gonna book mark you. Hiya. I’m also from Detroit, and am the proud owner of the world’s dumbest dog. He’s a basset hound, since I’m sure you’re dying to know. I’d ask you to marry me, but I’m pretty sure that both gay marriage and polygamy are still illegal here. None the less, it’s nice to meet you Goldfish. Nice. Thankfully, I own a dog of average intelligence. I’d hate to have two of them. Nice to meet you too. Thanks for stopping by! I like this and thanks I do have excellent taste in things if i say so myself 😉 take care. Good morning! 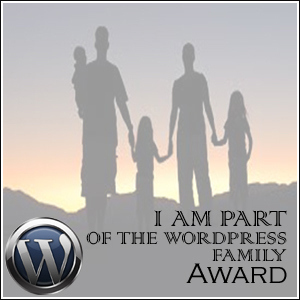 I wanted to give you the WordPress family award. It’s not an award that means a lot of work on your part, it’s just a way to say thanks for being a great support in my journey through blogging and through life. Hey Goldfish! Thanks for following my blog! I really like your header–so cool. It’s nice that you’re not trying to please anyone with your blog–you are who you are and that’s great! Glad to have found you! You are part of my Word Press Family. I would be DELIGHTED if you accepted. True story: A goldfish we kept in a giant plastic salad bowl on top of the fridge once made a William Wallace like bid for freedom by leaping out of his balsamic stained home and onto the kitchen floor where he flipped and flopped until he was heard by us in the other room. Luckily we were in time. I really enjoyed your ‘about page’ and look forward to exploring your blog a lot more. If you care to, I am writing over at Wine and Cheese (Doodles)–just another blog here at WordPress. Hiya Goldfish, I seem to recall you don’t do awards as such (yjough I’ve seen you get many!) but I had to nominate some people so I nominated you because you’ve been a huge inspiration to me for almost my entire blogging career (I was also required to leave a comment letting you know – so here it is). Thanks for following my bloggy-space! I am in the Inland Empire, so in the huge land that is SoCal, we’re neighbors! I’ve just nominated you for the Sunshine and WordPress Family awards. Feel free to accept or not, but it was really just a way to thank you for being part of my little WordPress family! Seattle is wonderful. Great restaurants and pikes market is a must each week. I also love the attractions there. They have one of the nicest Zoo’s right in the city. Portland is only a 3 hour drive. Hehe, my hair is a mess, but thanks ;). You seem to be a nice fish/not-really-fish/ creature in general. If you can’t accept, I ask you please pass this to a friend you know will accept. All about sharing the caring.. I just wanted to let you know how inspiring you are, so I nominated you for The Very Inspiring Blogger Award. If you choose to participate and want to claim your award, go here: http://grimmsfurrytail.wordpress.com/2013/07/31/a-debt-of-gratitude/. If you choose not to, that’s cool, too. You’re still inspiring! Well, I should have at the very least read your About. I described content as playful. Now you know I was just skimming the surface. I’m sorry you have encountered mean and abusive people. As a Mom it makes me CRAZY when people are “hasty” in the grocery store with their tired cranky kids—you can imagine how FURIOUS I am with anyone who would harm or fail to protect a child. I love your Gripes and Drat & Blast. I am here on account of revis and matticus. So you can thank them later. I’m new to WordPress! Any new comments or pointers would be much appreciated! Super cute blog! Quirky and enjoyable. Come play in my world at http://www.thatssojacob.wordpress.com 🙂 gracias! I love the goldfish trading card. How fun!